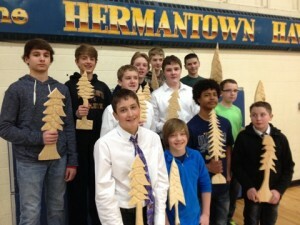 The middle school in Hermantown, Minn., provides a popular carving club for students. Now in its second semester, this successful club has generated a keen interest in carving among students, faculty and parents alike. It has also produced a growing number of talented carvers. 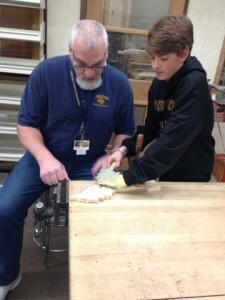 The inspiration behind this school carving club began with woodcarver Nancy Borson and her grandson Kade, who clearly demonstrate that the apple does not fall very far from the tree. Nancy taught herself how to carve in the 1960s, while living at a remote canoe camp in northern Minnesota. Later, after relocating to Rochester, MN to take a position as a research biochemist at the Mayo Clinic, she hooked up with the Rochester Carving Club. “That club was a huge part of my life for many years,” Nancy mused. After retirement, Nancy moved to back to the Duluth area where she hoped to join another carving club, only there was none. 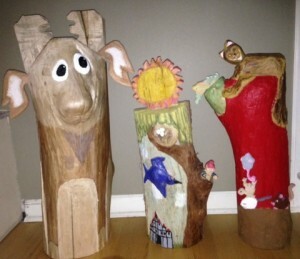 So Nancy started a carving club there in 2011 called The Knotty Carvers of the North. That burgeoning club now has over 40 active members. 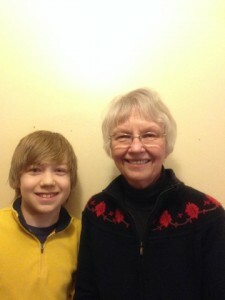 Since none of Nancy’s three children ever showed an interest in carving, she was caught by surprise when her 11 year old grandson Kade Borson asked her to teach him to carve. “I began to think in terms of big wood, big tools, big projects where we could use a mallet, chisels and gouges rather than small, sharp knives,” Nancy explained. A story pole provided the perfect solution and Kade loved it. “I really enjoy the fact that you can make your fantasy visions a reality with carving,” he said. 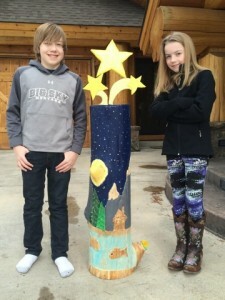 Kade’s younger sister Kiera started her own story pole too.